When it comes to shaping public perception, language matters. A community of dad bloggers is trying to make that point as they work to convince Amazon, the online retail giant, to change the name of its parent-focused discount program Amazon Mom to the more inclusive Amazon Family. This campaign has exploded over the last month, and a Change.org petition calling for the name change now includes more than 10,000 signatures. It is a fair question to ask why this matters. What's so significant about a name? Aren't there bigger issues to worry about? In rebuttal, consider the enormous influence corporations, like Amazon, yield when it comes to crafting perceptions. For years, dads have been pushed to the margins. For more than 25 years, my law firm Cordell & Cordell has aggressively championed the rights of fathers, but they are still unfairly dismissed in instances like this. A recent study from the Yale School of Public Health discovered most parenting programs focus solely on mothers. Far too often, fathers are perceived as a secondary parent, providing a source of income while the mother serves as primary caregiver. This is especially baffling considering the role of fathers has evolved dramatically. According to Pew Research, the number of stay-at-home dads increased from 1.1 million in 1989 to 2 million in 2012. A report published by The Council of Economic Advisors found that fathers are devoting 4.6 more hours to childcare duties and 4.4 more hours to housework each week than in 1965. Still, outdated stereotypes persist, including in family courtrooms where men face antiquated gender stereotypes. Too often, lawyers, and even judges, are willing to accept the status quo. That leaves many men in a battle for even the most basic rights to remain a part of their children's lives. Despite this ongoing struggle, Cordell & Cordell remains committed to helping fathers level the playing field in the family court system. Some progress has been made. There is a growing push towards default equal parenting and multiple states are currently considering bills that would eliminate permanent spousal support and result in more just alimony statutes. Popular culture has also started taking note of the developing image of fatherhood. During Super Bowl XLIX, Toyota, Nissan, and Dove Men+Care featured high-profile advertisements depicting fathers in caring, nurturing roles with their children. Still, the fact that a company as prominent as Amazon would seemingly thumb its nose at fathers is indicative of how much work remains. 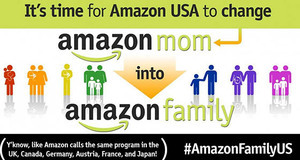 What is particularly frustrating is that Amazon seems to be saying that fathers specifically in the United States are lesser parents. 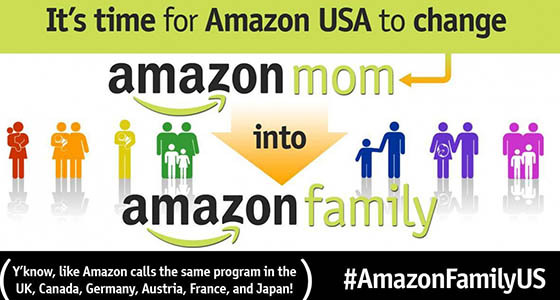 The program is already referred to as Amazon Family in the United Kingdom, Canada, Germany Austria, France, and Japan. What does it say about our culture when fathers in other countries are given more credence than those in the U.S.? Fathers matter. Companies like Amazon, and courtrooms across the country, need to acknowledge as much.